Charles L. Bowers School Farm – Bloomfield Hills School District. Bowers Farm is located on Square Lake Road between Adams and Squirrel Roads in Bloomfield Hills Township. The Oakland County Master Gardener Society, Inc. is the largest Master Gardener Society in the State of Michigan. Although MGSOC offers many opportunities for education and volunteering, the Charles L. Bowers School Farm is our largest project. The Bowers Farm gardens open in April and the date is usually tied in with the first of two Open Barn weekends which signals the start of a new season. Work days are weather dependent, and usually late October is the time to close it down for a winter’s rest. An orientation is held in early spring where information about being a volunteer at the farm is given out. Trainees are welcome and encouraged to join! A team of approximately 55 Master Gardener Volunteers of the Master Gardener Society of Oakland County design and maintain approximately 35 gardens of all types at the Bowers School Farm in Bloomfield Hills, Michigan. 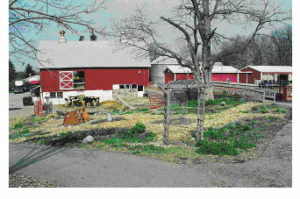 The Bowers School Farm was purchased in the mid-1960s by Bloomfield Hills Schools to be used as a land laboratory. It is housed on 90 acres. Farm animals at the farm are used daily to maintain the property as an educational agricultural production enterprise. It is open daily, year-around for various educational programs and community events. Bowers School Farm is a proud partner of Michigan State University Extension, the Bloomfield Historical Society, and the Master Gardener Society of Oakland County. The latest research-based curriculum and experiential methodology inform the instructional design of their hands-on school and community programs. Focusing on the process of science, educators from MSU enhance the unique learning experiences, activities and hands-on workshops at the farm. These experiences give students the opportunity to understand the interconnectedness between science, food and the natural world. 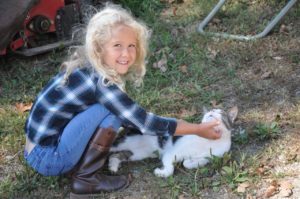 The target audience for extension Master Gardeners who volunteer at the farm is the student population of the school and visitors to the farm, estimated to be in the area of 21,000 (35,000 including repeat visitors). 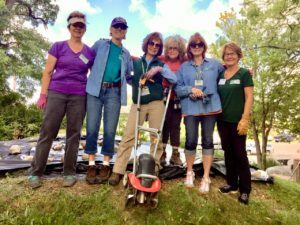 This group of volunteers, comprised of new and seasoned Master Gardeners (many are Advanced Master Gardeners) have worked at the farm for many years on Wednesday and Saturday mornings. There are many types of gardens including PAR, sensory, thyme, herb, shade, pollinator, MonarchWatch.org, cottage, rain, rose, log cabin, and more. Three years ago, we took over maintenance of the Barton Farmhouse gardens and the planters – under the auspices of the Bloomfield Historical Society – and in collaboration with landscape architect Michael Dul of Birmingham. The farmhouse gardens include historical plantings from the period of the farmhouse. In 2018, Master Gardener Volunteers at the farm have been asked to design and plant additional new gardens. The first will be an authentic Pioneer medicinal/culinary garden at the historic Craig Log Cabin which will be planted in spring of 2019 under the direction of MGV Martha Humphrey. We are working to restore the hardscape area, built by Goldner Walsh Nursery several years ago, to the intended more formal gardens. We now have their original landscape drawings to work with and hope to make this area of the farm suitable for weddings and events. This year, we partnered with the education staff at the farm to work on furthering and expanding educational projects with the students and in the spring taught several students “how to” plant a vegetable garden. A new and large “grasses” garden was recently planted. This garden of native grasses will act as a buffer to road noise between Square Lake Road and the gazebo, and includes pathways for the children to play. We have taken out the gardens at the cottage which were overgrown, and will be replanting them in 2019 with an improved design and an eye toward more natives and pollinators. In 2017, Our Plant-A-Row (PAR) gardens raised a record 850 pounds of fresh produce which was donated to the White Lake Pantry, 2018 yielded 296 pounds. We have worked to enhance the raised handicapped-accessible Sensory Garden and have added new and interesting sensory plants this year. With an eye toward more native and pollinator plantings, we also created a registered MonarchWatch.org butterfly garden which includes water features and garden art. Master Gardener Volunteers partnered with the farm for their Fall Farm Fest in the last two years, with volunteers providing tours of the garden and answering horticulture questions. T he educational component of our work there is significant. We are all about EDUCATION! Often, when we are working there, schoolchildren, as well as adults, come through. We pride ourselves on being able to answer their questions and pique their curiosity. This year, in a partnership with Tollgate Farm, we were able to add educational individual signage to most of the plants and shrubs at the farm. MGSOC donated a significant portion of the funds to purchase the digital engraving machine housed at Tollgate farms, and we are also the recipient of being able to use it for our educational purposes at Bowers Farm. Bowers Farm is in the throes of major renovation – destined to become a significant event center hosting weddings and other large events, and plans are in the works to renovate many areas of the farm and buildings with that in mind. They have advised us that MGSOC and our work at Bowers are an integral part of their plans. Over the 2018-2019 winter months, we will be partnering with Michigan State University, Alan Jaros, the Director of the Charles L. Bowers School Farm, the Bloomfield Historical Society and team leaders of the Master Gardener Volunteer group to design and implement a new Children’s Garden. Stay tuned for more. The financial impact of the Master Gardener Volunteer program to the Charles L. Bowers School Farm is significant. At an hourly rate of $22.96/hour (our current hourly value as assigned by Michigan State University Extension), in 2018, 55 volunteers devoted 1,014.5 hours, for an annual value of $24,307.49. Total value to the farm over the past five years is $133,241.